Climbing Psychology: Who Do You Climb With? Who Do You Climb With? I recently took some friends outside climbing who were new to the sport. One of them said, “Thanks for taking us, we know you’d probably rather climb with harder climbers.” Not really, I replied. I like climbing with all levels of climbers because I enjoy climbing – period. But then it got me thinking of other combinations of climbers and their differing ability levels. Have you ever thought about who you climb with and what, if any, purpose it serves? Most of us have climbing partners that either climb harder than we do or are less experienced than us. It’s very rare, in my opinion, that you find climbing partners who are at the exact same level as you are in ability, skill level, experience and what grade they climb. Most of the time I don’t think it matters who you climb with as long as you have fun climbing together. But when does it matter? It matters when you are setting goals, working towards those goals and possibly when you feel stuck in those goals. We need someone who can push us, encourage us, lead us, support us and help us grow. Does that person have to climb harder than us? Not necessarily but it helps if we are growing. What if my partner is less experienced or skilled than me? Then they better be a good cheerleader and push us to grow. Essentially we all need an “Evolutionary Partner,” someone who helps us grow no matter what skill level each of us are at. If we can fluidly exchange roles of supporter and encourager than both climbing partners benefit. It’s when we get stuck in our roles based on respective skill levels that growth can stop. This concept can transfer to the rest of your life too. 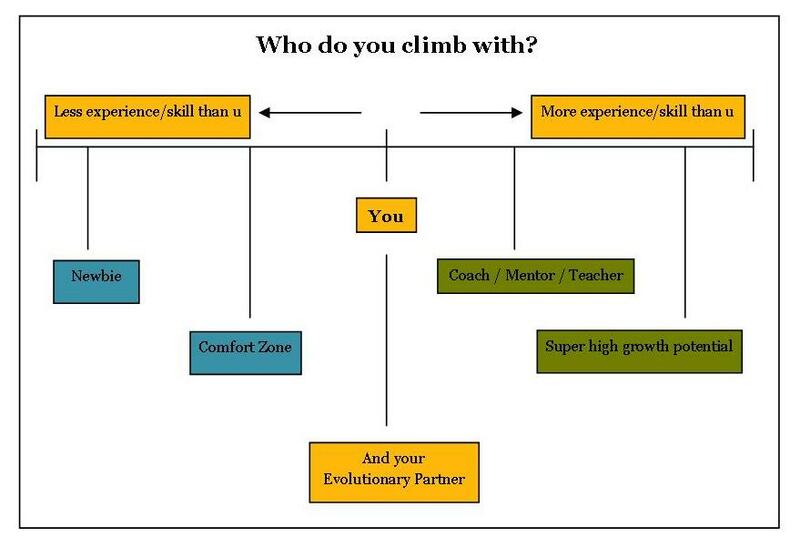 Do you have an Evolutionary Partner outside of climbing that pushes you to grow and succeed in school or your career? Can you be an Evolutionary Partner for someone else? The types of people I climb with and the types of people I wish I climbed with aren't as similar as I would prefer. The types I climb with are primarily a function of who is available for midweek climbing. I don't believe that the types I climb with are much of a reflection of me; I don't think that my partners exercise choice in not climbing with me or in climbing with me. I believe it's primarily and nearly exclusively a function of who can climb during the midweek. In recent many years I have begun to decline to climb with many people that I had climbed with in the past. My change lie in trying to better manifest the ideal that I hold in my mind. Just last year and this I can happily say that the types of people that I climbed with are much closer to the types of people I want to climb with. One strong influence in who I climb with is the routes I choose and the consistency in the exact types of routes I choose. Grade IV in a day and Grade V in a day of traditional climbing multipitch raises the bar so high that few, very few, can participate. Last week I left home 2:30am, drove 2.5 hours, hiked 2 hours, climbed 12 pitches, hiked 1.5 hours, drove 2.5 hours...... a 21 hour day, splendid. There is simply no way a climber with significantly lesser climbing skill could complete such an objective. Now that my climbing days are as such, my choice in partners is severely reduced and this is good because these rare partners will fit much better with me. So in considering who I climb with presently I can say that they are never below my skill level because they simply would not be capable of completing the types of climbs I am climbing. I wish I had partners that were far more skillful than me, but that has not happened yet. And I know that in upcoming years that will happen, because I will manifest it. Of my top 3 partners in recent 2 years I would quickly describe each of them as Evolutionary Partners, to me. Oh my dear friend, David. I love when you comment on my blog as anonymous. I also love your feedback and how I feel slightly told off by your fresh perspective - yet I still love it! Write more often! This blog explores the psychology of rock climbing through the lens of one climber's experience and her curiosity as to why no one else is really talking about it. Suscribe to receive the latest post! Sign up to receive new posts by email. Go to: "Suscribe to: Posts (Atom)" at the bottom of all the posts - and follow the prompts. Your info is confidential and won't be shared with anyone. Below is a list of resources that I have found helpful in my quest to learn more about the psychology of rock climbing. It will keep growing so check back often! Copyright © Rana Betting, 2010-2011, All Rights Reserved. Simple theme. Powered by Blogger.